As any researcher will know, producing scientific work that pushes the boundaries of science is an intensive process that requires rigorous planning, hard work, commitment and creativity as well as a scientific culture and a working environment that supports these efforts. Recognising contributions that advance scientific knowledge is therefore essential to nurturing and maintaining successful research environments. With this in mind, anasr.org  launched the first edition of the Algerian Paper of the Year Awards in January 2013. Our aim is to establish these awards as an annual event to recognise and celebrate the achievements of Algerian scientists through a process of nomination, shortlisting and peer review that fully engage the wider community of Algerian scientists and researchers in and out of the country. To the best of our knowledge, the independent initiative to seek out the best papers from across all research output stemming from Algerian universities and research centres is the first of its kind. It was therefore clear to us from the onset that this first edition was going to be as much a learning experience as a challenge to pursue and unravel excellence in Algerian scientific research. As we embarked on this journey, we encountered a variety of challenges that we needed to carefully plan for and think through to make sure the awards experience is of the highest quality for candidates and audience alike. We thus initiated a planning phase that spanned from October to December 2012 and we set January 19th 2013 as the target date for the official launch of the awards. The aim was to organise the awards process into three stages; inviting nominations from the community of Algerian scientists and researchers; shortlisting the top papers for each nomination category; and reviewing shortlisted papers by a number of panels made up of internationally renowned and expert reviewers. Amongst the very first of the challenges that we encountered was deciding on how to categorise potential nominations for the awards into appropriate areas of specialism. This is something we needed to do before opening up the actual call for nominations. The issue of classifying academic disciplines is not a new one and by no means unique to the awards we were about to launch. We have in fact encountered this very challenge when setting up the online directory of the Algerian network for academics, scientists and researchers. But after extensive discussions we decided to group nominations into five general categories: Biological Science, Chemical Sciences, Computer Science and Engineering, Medicine, Pharmacy and Veterinary Science, and Physical Sciences and Mathematics. The aim behind grouping disciplines in this manner was to ensure that each category can encompass a wide range of specialisms and so would allow for more flexibility in terms of the number of potential nominations. Not including a general category for social sciences was a particularly hard decision to make, but considering the resources available to us, this was unavoidable. The Awards Committee  pledged to strive to ensure that this category is included in future editions of the awards. Inviting nominations involved addressing two challenges, first setting up appropriate criteria for accepting nominations, and second, finding potential candidates for the awards who would satisfy the set criteria. We wanted to make the criteria as simple and as encompassing as possible in order to ensure the maximum number of nominations. Since this was going to be an annual award, nominated papers needed to have been published during the preceding year; that is between the 1st of January and the 31st of December 2012. We also emphasised that the work had to be conducted in an Algerian university or research centre; this was an going to be an Algerian paper of the year awards after all, but at the same time we did not want to exclude published work which involved collaborative work across institutions in and out of the country. A second criteria therefore emphasised that no less than 50%+ of the published work must have been conducted in Algeria. Finally, we set the deadline for receiving nominations for the 1st of March 2013, and we did not accept any nominations received after this date . As we delved into thinking about addressing the second challenge of how to identify potential candidates for nominations, we realised just how much Algerian universities are lagging behind in terms of exposing high quality output of the research conducted within their labs and departments. As is the case with many renowned universities around the globe, a simple visit to a university website will often allow visitors to access the latest exciting results or projects stemming out of their establishment in the form of news items or announcements. Similar dedicated efforts to expose local achievements in Algerian universities would have been an obvious place to start to seek out potential nominations for the awards. Instead, we opted for a three-actions strategy: First, we contacted heads of departments across Algerian universities – at least those which provide such contact details on their websites – and invited them to spread the word about the awards and encourage their researchers to nominate their papers. Second, we searched through online publications repositories and journal databases, as well as proceedings of renowned conferences using keywords such as “Algeria”, “Algerian” and “Algérie” for authors affiliations . Whenever we came across a relevant paper, we sent an email to the corresponding authors to invite them to nominate their paper for the awards. Put together, over 800 emails were sent to heads of departments and authors using this process. Finally, we also used anasr.org’s various social media outlets  to further advertise the awards and call for nominations. Figure 1. 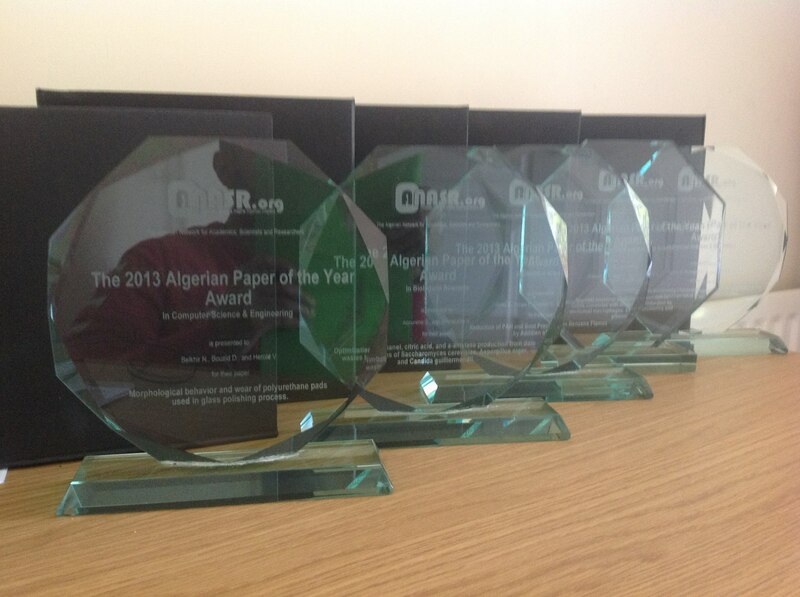 In numbers, papers nominated for the 2013 Algerian Paper of the Year Awards. As planned, nominations were officially opened on the 19th of January 2013 and closed on the 1st of March 2013. By that time we had received an impressive 160 nominations across the five categories. 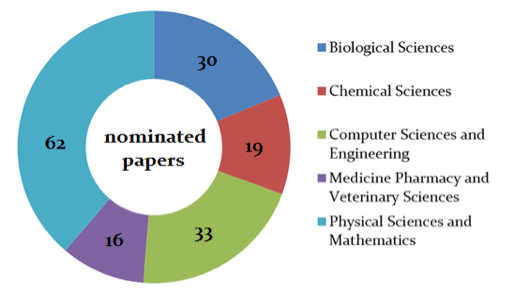 Specifically, 62 papers were nominated under Physical Sciences & Mathematics, 33 under Computer Science & Engineering, 30 under Biological Sciences, 19 under Chemical Sciences and 16 under Medicine, Pharmacy & Veterinary Sciences (see Figure 1). It would not have been feasible to conduct thorough reviews of all the 160 nominations we received, indeed most of these nominations were of papers which had presumably already gone through a peer reviewing process before they got published in their respective journal or conference proceeding. Instead, we recruited a group of 15 academics and researchers to take part in a shortlisting process. The aim of this process was two folds; first to ensure that nominated papers matched the eligibility criteria for the award and flag them otherwise, and second to examine and sift through all nominations in order to pick out the top papers that, in the opinion of the shortlisting panel members, constituted the most promising candidates for the awards. We didn’t set strict instructions for the members of the shortlisting panel for how they should go about doing this. Instead, we asked them to take the following points into consideration while making their choices: 1) is the work novel? 2) does it address significant aspects in its field of specialism? 3) are the experiments and analyses rigorous and well presented? Each member of the shortlisting panel provided us with a ranking of the top papers in each category of nomination. The challenge was then for us to determine how to corroborate the rankings that we received. In order to address this, we put together a scoring system that rewards points to different ranking positions in a list and we set the cut off ranking to be the top five. Papers that ranked 1st scored 10 points, those ranking 2nd scored 7, the 3rd scored 5 points, the 4th scored 3 points and the 5th scored 1 point. Using this scoring system, papers were re-ranked on the basis of how much they scored across all the shortlists, and the top five papers in each category that emerged through this process progressed to the reviewing stage. In total, 27 out of the original 160 nominated papers were shortlisted for the next stage. Notably, six instead of five top papers progressed to the next stage for two categories; Biological Sciences and Medicine, Pharmacy & Veterinary Science, because pairs of papers scored evenly in these categories. It is also worth noting that we made sure each paper was considered by three different academics during this shortlisting stage, and that we strived to keep all stages as free as possible from any potential conflicts of interest. To this end, we asked members of the shortlisting panel to flag any such potential conflicts, and indeed the shortlists produced by one member of the recruited panel was discarded due to a flagged conflict of interest. Once the top papers from each category were shortlisted, we were in measure to invite appropriate reviewers with relevant expertise to examine them with more scrutiny. The shortlisted papers were reviewed by a total of 26 senior academics and research scientists . Reviewers were asked to score papers out of 10 on the following criteria: 1) novelty of the work, 2) quality of the experiments, statistics and/or other analyses, 3) significance of the findings, 4) presentation of the work in terms of structure and language standards, and 5) potential impact. Papers that scored highest were subsequently chosen as the 2013 Algerian Paper of the Year in their corresponding category of disciplines. Biological Sciences: Acourene S. (1), Ammouche A. (2), Optimization of ethanol, citric acid, and a-amylase production from date wastes by strains of Saccharomyces cerevisiae, Aspergillus niger, and Candida guilliermondii. Journal of Industrial Microbiology & Biotechnology, 2012, Volume 39, Issue 5, pp 759-766. Authors affiliations: (1) Station of Algerian National Institute of Agricultural Research, Touggourt BP 17, 30200, Ouargla, Algeria. (2) National Institute of Agronomy, El-Harrach, Algiers, Algeria. Chemical Sciences: Golea D., Rezgui Y., Guemini M., Hamdane S., Reduction of PAH and Soot Precursors in Benzene Flames by Addition of Ethanol. The Journal of Physical Chemistry A, 2012, Volume 116, Issue 14, pp 3625–3642. Authors affiliations: Laboratoire de Chimie Appliqueé et Technologie des Mateŕiaux, Université d’OumEl Bouaghi, OumEl Bouaghi, Algeria. Computer Science & Engineering: Belkhir N. (1), Bouzid D. (1), Herold V. (2), Morphological behavior and wear of polyurethane pads used in glass polishing process. Precision Engineering, 2012, Volume 36, Issue 4, pp 641–649. Authors affiliations: (1) Institute of Optics and Precision Mechanics, Ferhat Abbas University Setif, Setif, Algeria. (2) Institute of Materials Science and Technology, Friedrich-Schiller-University Jena, Germany. Medicine, Pharmacy & Veterinary Sciences: Abdelouhab K., Rafa H., Toumi R., Bouaziz S., Medjeber O., Touil-Boukoffa C., Mucosal intestinal alteration in experimental colitis correlates with nitric oxide production by peritoneal macrophages: Effect of probiotics and prebiotics. Immunopharmacology and Immunotoxicology, 2012, Volume 34, Issue 4, pp 590-597. Authors affiliations: Department of Biological Sciences, Laboratory of Cellular and Molecular Biology, Cytokines and NOSynthases Group, USTHB, Algiers, Algeria. Physical Sciences & Mathematics: Bouras M. (1), Boumaiza A. (2, 3) , Ji V., Rouag N. (3), XRD peak broadening characterization of deformed microstructures and heterogeneous behavior of carbon steel. Theoretical and Applied Fracture Mechanics, 2012, Volume 61, pp 51–56. Authors affiliations: (1) Département Génie des Procédés, Faculté des Sciences et de la Technologie, Université de Jijel, Jijel, Algeria. (2) Département de Physique, Faculté des Sciences Exactes et des Sciences de la Vie et de la Nature, Université de Jijel, Jijel, Algeria. (3) ICMMO, UMR CNRS 8182, Université de Paris Sud, Bât 410, 91405 Orsay Cedex, France. (4) Laboratoire Microstructures et Défauts, Faculté des Sciences, Université Mentouri Constantine, Constantine, Algeria. anasr.org is an independent initiative, developed and maintained on a voluntary basis without external funding by a dedicated and growing team of Algerian scientists and professionals. As a community led initiative, we at anasr.org strive to seek funding only from the community that we aim to serve, in line with our core mission and principles. We thus turned to the community to raise the funds needed to sponsor the 2013 Algerian Paper of the Year Awards. The fundraising process was vastly successful and the community came together beautifully and generously to help us cover the majority of the costs, which included producing the award plaques and certificates as well as their shipment to Algeria. A full financial report of this year’s edition of the awards can be found here. The 2013 edition of the Algerian Paper of the Year Awards has been a great success and we are confident that this year’s winners present a representative snapshot of the highly interesting and exciting research development that stemmed from Algerian universities and research centres during the year of 2012. We, however, are striving to make future editions of the Awards even better and to achieve this, we invite everyone who was involved in the awards from close or far, those who nominated their papers, those who helped shortlist and review them, as well as everyone who followed this exciting venture from its inception to send us their feedback, comments and suggestions to awards@anasr.org. The 2013 Algerian Paper of the Year Awards was indeed a challenging but rewarding journey that lead us to meet brilliant Algerian scientists from all over the world who share the simple objective of promoting excellence, hard work and genuine scientific curiosity. We hope that readers find as much pleasure in discovering and getting inspired by such Algerian intellect as we did in uncovering them, and we look forward to next round of the Algerian Paper of the Year Awards scheduled to launch in January 2014.
 anasr.org is an independent organisation aimed at developing an interaction space to discover, share and inspire Algerian intellect across the globe. Members of the 2013 anasr.org Awards Committee were: Dr. Youcef Mehellou (Chair), Dr. Oussama Metatla (Co-chair), Dr. Amel Saadi, Mr. Mohammed A. Teffahi. Reviewers of the 2013 Algerian Paper of the Year Awards: Dr. Goodarz Ahmadi, Dr. Said Dermime, Dr. Radhika Nair, Dr. Hakim Djaballah, Dr. Paul Trippier, Dr. YangQuan Chen, Dr. Ahmed Chenna, Dr. A. Ouahabi, Dr. Osman M. Ozkendir, Dr. Marco Derudas, Dr. Kityk Iwan, Dr. Yannis Stamatiou, Dr. Mike Gonzalez, Dr. Muhammad Sohail, Dr. Djamel Rezgui, Dr. Kevin Devine, Prof. Nadia Boutaoui, Dr. Sathyajith Mathew, Dr. Abdeljalil Bennecer, Dr. Alessio Del Bue, Dr. Li-Wei Chou, Dr. Mounia Lalmas, Dr. Kenjiro Terada, Dr Refaat Hamed, Dr. Renata Wachowiak-Smolikova and Prof. Igor Aizenberg.